Most of the Asia’s stock markets ended on a positive tone following the release of China’s 1Q19 GDP, which stood at 6.4% YoY, beating consensus estimates of 6.3%. The Shanghai Composite Index and Nikkei 225 added 0.29% and 0.25%, respectively, but Hang Seng Index slipped marginally by 0.02%. Meanwhile, sentiment on the local front were negative as broader market (661 decliners vs. 208 advancers) went into another round of profit taking mode and the FBM KLCI declined 0.53% to 1,620.90 pts. Also, the negative news flow of Malaysia bonds that may drop out from FTSE World Government Bond Index has further dampened the market tone. Market traded volume stood at 3.10bn, worth RM1.85bn. Nevertheless, we noticed gloves stock such as Top Glove, Hartalega and Kossan traded higher amid the weaker ringgit throughout the session. Despite the better-than-expected China’s 1Q19 GDP, coupled with stronger earnings from Pepsi and Morgan Stanley, Wall Street ended on a softer note dragged by healthcare sector. The Dow and S&P500 0.01% and 0.23%, respectively, while Nasdaq dropped 0.05%. 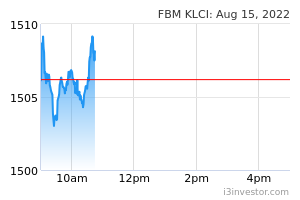 The FBM KLCI continues to violate below the immediate support, marking a fresh two-year low. The MACD indicator has formed another negative cross and MACD Histogram has turned below zero. Meanwhile, both the RSI and Stochastic oscillators are hovering below zero. With slightly weaker technical readings, we believe KLCI’s upside will be limited and the support will be located around 1,600-1,614. On the local front, we expect bargain hunting activities to emerge after few round of selling activities on the FBM KLCI; key index support will be located around 1,600. At the same time, we see opportunities within the export-related stocks within the gloves, technology and furniture sectors on the back of weakening bias ringgit. The Dow trended sideways over the past three trading days after the gap-up formation last week. The MACD indicator has turned flattish, while the Stochastic oscillator is overbought; suggesting that the upside could be limited over the near term. The resistance will be envisaged around 26,500, while support will be located at 26000, followed by 25300 (SMA200). In the US, we believe the ongoing US corporate earnings season would be one of the focuses this month as the US-China trade talks have been going under the radar and traders may trade cautiously over the near term. Nevertheless, firmer crude oil prices are likely to lift the trading interests within energy sector in the US. HSL announced that it has been awarded a RM299m contract by the Sarawak state government for construction of the Batang Paloh Bridge in Mukah. The work is expected to commence in May 2019 and completed within a period of 48 months. Increase FY19-20 earnings by 6% and 11% respectively after increase our FY19 orderbook replenishment target to RM500m (from RM300m). Upgrade to BUY with higher TP of RM1.76 (from RM1.41) after earnings forecast adjustment and higher PE multiple of 12x (from 10x) as we deem HSL as a major beneficiary of Sarawak’s robust infrastructure expenditure. Batang Paloh bridge contract. HSL announced that it has been awarded a RM299m contract by the Sarawak state government for construction of the Batang Paloh Bridge in Mukah. This contract falls under Package 3 that is part of the RM11bn allocated for the upgrading works for the coastal road, second trunk road and water supply works in Sarawak. The work is expected to commence in May 2019 and completed within a period of 48 months. Second construction job win. This is the second construction job win for HSL and this brings its YTD job wins to RM354m, exceeding our FY19 orderbook replenishment assumption of RM300m. Its outstanding orderbook currently stands at c.RM2.5bn which translates to a decent cover of 4.8x on FY18 construction revenue. Sarawak the next place to be. Job flows in Peninsular Malaysia have slowed down significantly post GE14. We understand that industry players are aiming for jobs in Sarawak as state government has allocated c.RM9bn for development expenditure under state budget 2019 which is the biggest in the history of the state. Funding for those projects is expected to come from Sarawak’s state reserves (c.RM31bn) which may insulate the projects from risk of reduction of federal government spending. Just this week, Opus was appointed as the project management consultant for the coastal road and second trunk road projects, indicating that these jobs are on the verge of rolling out. The momentum of project flows in Sarawak should also gain traction as the next state elections must be held before Sept 2021. Forecast. Increase FY19-20 earnings by 6% and 11% respectively after increasing our FY19 orderbook replenishment target to RM500m (from RM300m). Upgrade to BUY, TP: RM1.76. Upgrade to BUY with higher TP of RM1.76 (from RM1.41) after earnings forecast adjustment and higher PE multiple of 12x (from 10x) as we deem HSL as a major beneficiary of Sarawak’s robust infrastructure expenditure, as evident by this recent job win. MQREIT is the first REIT under our universe to open its doors to co-working space. We feel this will act positively to MQREIT as it will give them a larger tenant base with multiple companies under the umbrella of the co-working space provider. Going forward, MQREIT will be focusing on cost management and tenant retention to ensure yield sustainability. Multiple AEIs are in place for FY19 in an attempt to stay relevant in the market. Our forecasts were adjusted by -5% post annual report and model upkeep. Following the dovish tone by major central banks and BNM, we revise our 10-year MGS yield assumption to 3.9% (from 4.1%) and roll forward valuation to mid FY20. We maintain BUY call with lower TP of RM1.17 (from RM1.23) based on targeted yield of 6.7% (from 6.9%). First to welcome co-working space. MQREIT is currently the first and only REIT under our coverage that has its opened doors to co-working space; with 45k sq ft in Platinum Sentral being leased to a multinational co-working space operator. Often, co working space operators would enter the business with the landlord by means of profit sharing. However in MQREIT’s case, this is on traditional rental terms. We comprehend that this will be a long tenure of 9 years with the option to extend for an additional 3 years, with an agreeable rental revision every 3 years. We understand that refurbishment works will begin this month and operations are expected to commence in July. We feel with the mushrooming of co-working spaces presents a symbiotic relationship to REITs. We believe that REITs will benefit by attaining better take up rate certainty through signing on 1 large tenant as opposed to multiple fragmented smaller tenants and we also believe that co-working operators can capture a larger tenant base than REITs can. Asset enhancement initiatives (AEIs). Allocated capital expenditure for 2019 is approximately RM10m which is mainly for AEIs. With the expectations of a challenging office market, MQREIT intends to enhance the aesthetics of the buildings to maintain its quality in order to preserve occupancy. Planned improvement works on several properties include: Wisma Technip (washrooms and external façade), Quill Building 5 – IBM (air conditioning system), Platinum Sentral (several common area facilities upgrades) and Menara Shell (lift systems). Looking ahead, management will be prioritising cost management as well as tenant retention over reversion growth. Occupancy and gearing. Occupancy rate fell but remained healthy at 93% (FY17: 96.3%); considering the average occupancy rate in Klang Valley has been falling and stood at 80% in 2018. The gearing ratio stood at 37.7%, comfortably below the 50% limit, with a majority of its total borrowings (76%) being charged a fixed interest rate. Forecast. Post release of annual report, our FY19-20 forecast adjusts by -5% due to model housekeeping. We also take this opportunity to introduce our FY21 numbers. 1QFY19 results will likely be released on 9 May after market close. Maintain BUY, TP: RM1.17. We maintain BUY with lower TP of RM1.17 from RM1.23 based on targeted yield of 6.7% (from 6.9%). Following the dovish tilt by major central banks (Fed and ECB) as well as BNM, we revise our assumption of the 10-year MGS yield to 3.9 (from 4.1%; currently at 3.8%). We also roll forward valuation to mid-FY20. To note, our valuation model is based on the targeted yield of 2-year historical average yield spread between dividend yield and 10-year MGS yield. We continue to like MQREIT given its attractive dividend yield of 7.0% (highest among REITs in our universe), stable assets in prime location of KL Sentral with high occupancy rate. We met with management for update on Hartalega. We expect a soft 4Q19 due to (i) forex impact (ii) minimum wage hike and (iii) competitive pressures on ASP translating into anaemic volumes. Consequently, we are revising our FY19- 21 earnings downward by 4.4%. Post earnings revision, our TP decreases to RM5.33 (from RM6.12), we also revise our PE to 33.7x (+0.5SD above 3 year mean). We are upgrading to a BUY on valuations (trading below its 3 year mean) as we believe the share price weakness has now offered sufficient buffer. We met with management to get an update on Hartalega. The following are some of the key takeaways. Recap. 9MFY19 revenue of RM2144.0m (+19.9% YoY) translated into core PATAMI of RM367.1m (+13.7% YoY). Volume improved on the progressive commissioning of Plant 5 (+3.0% QoQ, +11.6% YoY), whilst ASP softened during the quarter (-2.0% QoQ, +6.4% YoY) due to the decline in Nitrile prices and competitive pressures. Capacity expansion. The commissioning of the first lines of Plant 6 (4.7bn pieces p.a.) which was earlier guided for 1HCY19 has now been pushed forward to 2HCY19. We view this in a positive light and in line with other industry players (i.e. Top Glove), which should aid in the alleviation of ASP pressure. Factory 5 which has 2 lines to go is being commissioned at a rate of 1 line per month from 2 lines a month. NGC-2. NGC-1 will culminate in Plant 7 (2.6bn pieces p.a. - specialty gloves) which has been guided to commence construction in mid-2019 with targeted commissioning of the first line by Jan 2020. We understand that concurrently, management are on the prowl for a parcel of land for NGC -2 (minimum size requirement is c.80 acres). We do expect an announcement sooner than later on this, given it is a crucial determinant for the group to sustains its multiyear earnings growth momentum. 4Q19. We expect a soft 4Q19, as margins face downward pressure on the back of (i) forex impact (USDMYR -2% QoQ) and (ii) the increase in the mandatory minimum wages in January (+10% YoY), against a backdrop of competitive pressures on ASP translating into anaemic volumes. AMG. We understand that Hartalega’s antimicrobial glove is still awaiting FDA approval. The approval process is lengthened given that the FDA views the AMG as a new product category. We expect contributions from AMG to be miniscule in FY20 before pace picks up post FDA approval expected in the latter part of FY20. Forecast. We are adjusting our FY19-21 earnings downwards by 4.4% as we account for expected lower volumes on market share losses due to competitive industry pressures within the Nitrile glove space. Upgrade to BUY, TP: RM5.33. Post earnings revision, our TP decreases to RM5.33 (from RM6.12). We take this opportunity to lower our PE target to 33.7x (+0.5SD above 3 year mean) from 37x (+1SD) to account for the challenges within the Nitrile segment. Despite the earnings and TP cut, we are upgrading Hartalega to a BUY due to (i) the anticipation of a weak 4QFY19 is has been largely priced in (-24% YTD), (ii) valuations have come off significantly in recent times, with the stock trading below its 3-year mean, having not traded at these levels since Oct 2017 (refer to Figure# 1) and (iii) sequentially weaker ringgit sentiment which should put export plays in flavour. PHARMA slid 52% post GE14 due to worries of a non-renewal of the 10Y concession agreement (ending end Nov 2019) as the group is viewed to be having monopolistic position. Nonetheless, we remain optimistic that PHARMA would still able to clinch the contract (albeit with modifications) premised on: (i) impeccable track record in L&D following huge amount of investment in its supply chain management to ensure efficient deliveries to public hospitals and clinics; (ii) the unattractive thin margins (~1.0-2.0%) from the concession business will discourage participation from other distributors due to high barriers of entry; (iii) highly unlikely that with PH’s financial position would undertake huge investments to emulate PHARMA’s model to ensure operational effectiveness and timely deliveries; (iv) increasing non-concession contributions from Indonesia’s market due to huge population over 270m people and (v) attractive risk-reward profile at 9.6x FY19E P/E and 1.2x P/B, which are 37% and 38% lower compared to its peers, supported by an attractive FY19-20 DYs of 7.4%. A good proxy to the defensive pharmaceutical sector. Pharmaniaga (PHARMA) has an exclusive right through a concession agreement (CA) with the Ministry of Health (MOH) to local and foreign principals with clients that include government hospitals, private medical centres, pharmacies and private clinics. Overall, PHARMA’s core business segments include logistics and distribution (L&D), manufacturing of generic pharmaceuticals and medical devices, sales and marketing as well as distribution of medical products and hospital equipment. In 2018, government revenue made up >90% of PHARMA’s revenue (~51%: concession; 49%: non-concession) segment. The remaining was contributions from Indonesia and other Malaysian private sector. Steeply oversold; Mild signs of bottoming up. In the short term, PHARMA could still engage in a consolidation mode as share prices continue to hover below immediate 10D SMA at RM2.05. Nevertheless, downside risk is limited as MACD histograms are on the mend, with +DMI is gradually hooking up. Once this pattern ends, we expect prices to stage a breakout above RM2.05 to advance further towards RM2.13 (100H SMA) and RM2.26 (23.6% FR) before reaching our LT objective at RM2.56 (50% FR). Key supports are RM1.93 (daily lower Bollinger band) and RM1.86 (monthly lower Bollinger band). Cut loss at RM1.83. Asia’s key benchmark indices ended on a higher note as People’s Bank of China decided on resumption of cash injections into the financial system, alleviating earlier concerns on tightening liquidity. Also, traders were fairly positive ahead of the release of China’s 1Q19 GDP and the US-Japan trade talks. The Nikkei 225 rose 0.24%, while Shanghai Composite Index and Hang Seng Index increased 2.39% and 1.07%, respectively. Meanwhile, the FBM KLCI traded marginally lower at 1,629.46 pts (-0.11%) and sentiment on the local front turned negative as profit taking activities emerged further on the broader market. market breadth was negative with 475 decliners vs. 375 gainers, accompanied by 2.49bn shares traded for the day, worth RM1.79bn. Wall Street ended on a higher note on the back of on-going better-than-expected US corporate earnings, coupled with a boost from Boeing after a report from FAA suggesting that the Boeing 737 Max software is “operationally suitable” after the recent update. The Dow and S&P500 gained 0.26% and 0.05%, while Nasdaq increased 0.30%. After hitting resistance along 1,640 two days ago, the KLCI retraced lower and the MACD indicator stayed flattish. However, both the RSI and Stochastic oscillators are showing an uptick move (albeit below 50). Hence, with the oversold and recovering technical, we believe that the KLCI could be due for a technical rebound with the resistance set along 1,640-1,650, support will be located around 1,600-1,614. We believe sentiment on the local front could remain cautious as market participants are selling on news following the revival of ECRL. Meanwhile, Tun Mahathir commented that “Malaysia does not need a high-speed-rail for now” may further pressure the recent rally on construction stocks. The FBM KLCI’s upside could be capped along 1,647-1,650 over the near term. Despite the Dow climbed higher yesterday, the MACD indicator has turned flattish and formed a bearish divergence signal (higher high on Dow, but lower high on indicator). Meanwhile, the Stochastic oscillator is overbought and the Dow’s upside could be limited over the near term. Resistance will be envisaged around 26,500, while support is anchored along 26,000. In the US, we opine that the market sentiment will be driven mainly by the on-going US corporate earnings season and market participants will be on a lookout for outlook guidance for 2Q19 onwards. Hence, should there be any negative management guidance in US corporates, it may kept a lid on Wall Street performances. At the same time, the uncertain progress on the US-China trade front is likely to dampen sentiment on Wall Street. Risk-reward profile is becoming more compelling after diving 52% post GE14. We remain optimistic that PHARMA would still able to clinch the contract (albeit with modifications) premised on: (i) impeccable track record in L&D following huge amount of investment in its supply chain management to ensure efficient deliveries to public hospitals and clinics; (ii) the unattractive thin margins (~1.0-2.0%) from the concession business will discourage participation from other distributors due to high barriers of entry; (iii) highly unlikely that with PH’s financial position would undertake huge investments to emulate PHARMA’s model t o ensure operational effectiveness and timely deliveries; (iv) increasing non-concession contributions from Indonesia’s market due to huge population over 270m people and (v) attractive risk-reward profile at 9.6x FY19E P/E and 1.2x P/B, which are 37% and 38% lower compared to its peers, supported by an attractive FY19-20 DYs of 7.4%.